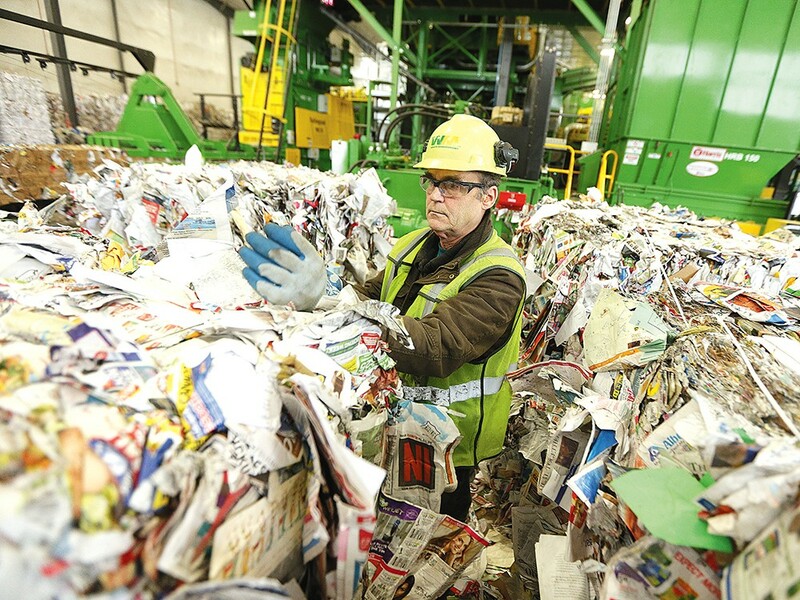 Rick McHenry removes items that don\'t belong from a bale of paper at Waste Management\'s SMaRT Center. For more than two decades, blue 18-gallon bins — full of newspapers and crushed milk jugs — peppered the sidewalks of Spokane. But all that changed last September, when Spokane neighbors were granted new 64-gallon and 96-gallon bins. And into those huge new carts, Spokanites can now dump mixed paper, aluminum foil, aluminum pots and pans, plastic dairy cups and mugs. They can chuck in Cap’n Crunch boxes, plastic water bottles, old Tom Clancy spin-off paperbacks, spiral-bound notebooks full of college biology notes, and the metal tines from broken garden rakes. The advent of “single-stream recycling” meant instead of being sorted curbside, all recyclables were sorted, bundled up and sold at a fancy new plant. The long-anticipated change, in effect less than a year, already is having a financial and environmental impact. At the new Spokane Material and Recycling Technology (SMaRT) Center, one of the old blue recycling bins slides down the conveyor belt, where a worker spots it and pulls it away. The thunking and whirring of the conveyor belts mesh with the blaring of an alarm, the beep-beep of forklifts backing up and the humming of tractor engines. Here, the factory floor is piled with 4-foot-wide cubes of crushed aluminum cans and newspaper bales, beside a forest of green and yellow machinery towers, platforms and scaffolding. All the stuff here doesn’t just represent Spokane County’s recycling. Waste Management purchases more from commercial businesses all throughout the Inland Northwest and Canada. Newsprint is sold to the Inland Empire Paper Company in Spokane. Wine bottles are turned back into new wine bottles in Spokane. Some plastics are shipped all the way to China. One experimental plant in Oregon is working to transform plastic into crude oil. Shifts in global markets can be a boon or a bane. Newsprint remains lucrative, for example, but the demand for glass bottles has fallen. Making single-stream recycling possible, even profitable, relies on a mix of sophisticated technology and old-fashioned human labor. One machine shakes up clumps of recyclables to make them easier to sort through, while another separates two-dimensional objects, like cardboard, from three-dimensional. One belt is magnetized, holding metal cans while dumping the rest. Another automatically detects clear items like plastic water bottles, calculates their position, and with a burst of air tosses them onto another belt. But even the most sophisticated equipment can’t match human eyes and hands. A line of workers in green hardhats peer into a swift river of recycling, snagging items that don’t belong. “This is our presort area. Their whole job is taking off everything that can damage the equipment further on,” Gimpel says. Rusted metal can cut the belts, and plastic bags, pieces of clothing and rope can become tangled in the machines. “A lot of times we get people getting seasick up here,” Gimpel says. Standing still, staring at a moving mass of trash, will do that. After a while, the employees switch, so at least they’re looking in a new direction. Shipping bales of recycled materials all the way to China carries an environmental cost. Yet more items are being recycled and fewer are filling up landfills. Waste Management has begun to add hybrid trucks. Saving the energy of mining and creating new materials has a big benefit. In 2009, one assessment found, recycling in Oregon made up for the emissions of 570,000 passenger cars. And for employees who rode trucks, it meant they no longer had to hop out to hand-sort through newspapers on winter mornings. The robot arms on the trucks could pick up the bins. In Spokane, garbage collection can be a sensitive subject. A decision to eliminate some garbage pickup in alleyways may have cost former Mayor Dennis Hession the election back in 2007. So when the new bins came out, some were skeptical. “Another giant ugly container to either put in my garage and take up a huge amount of space — or park it outside to get snowed on,” Mike Davis said in a letter to the Spokesman-Review. An older woman called The Inlander, complaining about how the big bins were harder to move. For 3,400 Spokane residents, it meant they could do without the larger garbage cans. Switching to a smaller size, they save $12 a month. The city receives less income, but the decrease in disposal costs makes up for it.